We also presented data about two different types of music streaming services: on-demand, interactive services such as Rhapsody and Pandora, and non-interactive services that include Pandora, all other webcast stations, and Sirius XM airplay. We asked about these separately because composers and recording artists are paid differently for each service type. 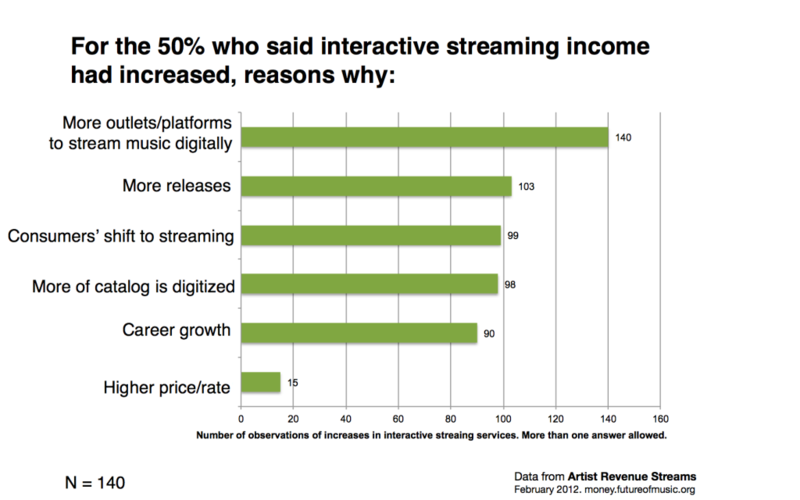 As we outline below, streaming services in general are not a significant revenue stream for many artists, but interview responses suggest this revenue stream is growing slowly as consumer use changes and more services come online. 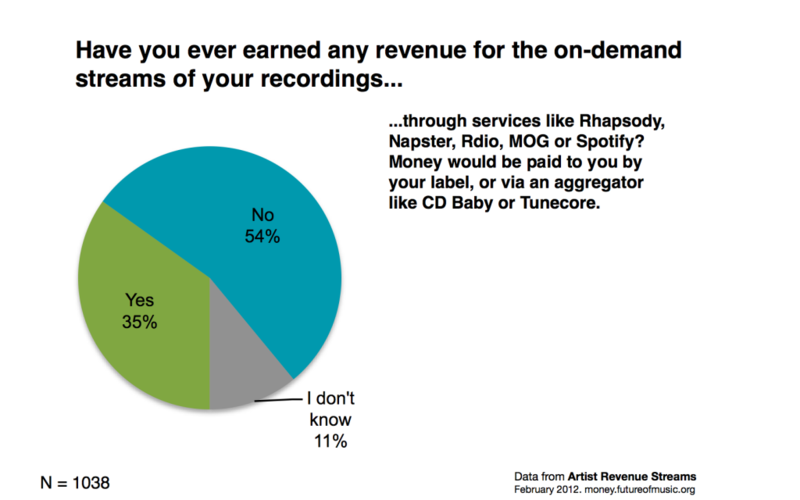 On the survey, we asked about income streaming sound recordings on interactive streaming services: Rhapsody, Spotify, MOG, Rdio, Slacker and so on. As this chart above indicates, only about 35 percent have seen income from this revenue stream…so far. There are a few likely reasons why this number is so much lower than the digital sales figures above. 1. Service adoption. Although Rhapsody has been active and paying royalties to sound recording copyright owners for over ten years, a number of these services – especially Spotify – are fairly new entrants in the marketplace, so perhaps the money hasn’t flowed through to musicians yet. 2. Limited awareness/knowledge gaps. This might also indicate a general lack of understanding about the differences among these services. For instance, musicians who use aggregators CD Baby or Tunecore to make their sound recordings available on the array of digital music platforms receive a monthly statement that itemizes all of the plays and downloads during that time period. But are musicians reading their Tunecore/CD Baby statements closely enough to know that they are receiving some of this income from interactive music services? Do they know the difference? 3. Service utility. Finally, there are a number of genres that are not served well by interactive streaming services — classical in particular. Those who are in a position to license their content to interactive music services may not be making it a priority. Given that classical was the most well-represented genre in this survey, this might be a reason as well. Then we asked survey takers why they think this revenue stream had increased. The main reason? More outlets and platforms, which reflects reality of the marketplace. Note at the bottom of this list; increase is not commonly attributed to a higher price/rate, which also reflects marketplace conditions. On the pie chart above, 11 percent of survey respondents (40 individuals) said they had seen their money from interactive services decrease. As with all revenue stream questions, we asked them to itemize the reasons for the decrease, but only 14 people did so, providing us with insufficient data to display. The third and final revenue stream we presented about at SF MusicTech was digital performance royalties. This is the money that featured artists receive when their sound recording is played on webcast stations (including Pandora), satellite radio, and on digital cable channels. This is, essentially, a new revenue stream that came into being in 1995 with the passage of the Digital Performance Right in Sound Recordings Act. Despite impressive market penetration of Pandora and Sirius XM over the past five years (and enormous sums of digital performance royalties generated as a result), only 13 percent of respondents had seen any digital performance royalties. There are potentially two reasons that this number is lower than income from digital sales, but they are slightly different than the reasons given for on-demand streaming services. 1. Lack of awareness of SoundExchange: SoundExchange is the organization that is responsible for distributing digital performance royalties to featured artists. In order to receive their royalties, artists must sign up with SoundExchange (it’s free to join), so that SoundExchange knows where to send the check. SoundExchange has invested heavily in generating awareness, but it remains difficult to reach all the artists who have accrued royalties. 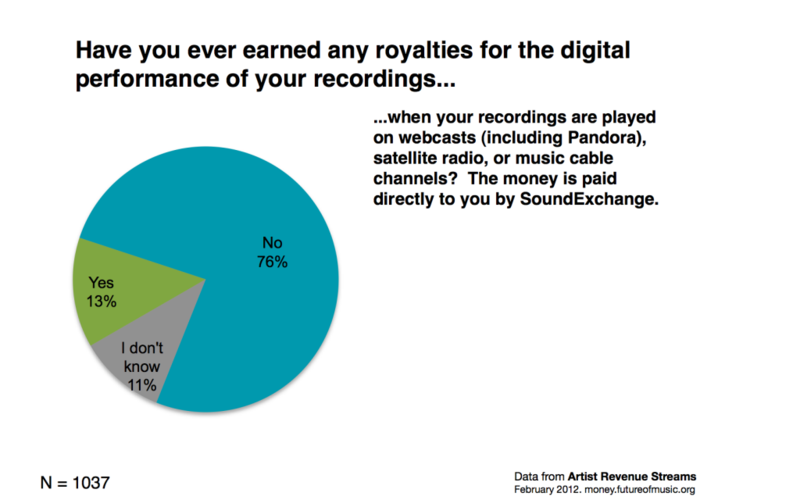 It might be that survey respondents simply don’t know about SoundExchange, or its role in distributing this revenue stream. 2. SoundExchange not the payee: We should also point out a possible limitation based on how we asked the question; the survey question asked whether they had received from SoundExchange, which distributes royalties to featured artists. Many of our survey respondents were salaried players. Those musicians might be seeing these royalties, but in their case they are not distributed by SoundExchange, they are managed by the AFM/AFTRA Fund. As with the other revenue questions, we also asked survey respondents about changes in this revenue stream over the past five years. For those 13 percent who said, yes, they have received some money from SoundExchange, 46 percent said it had increased, and another 30 percent said it stayed the same. This clearly matches expectations. 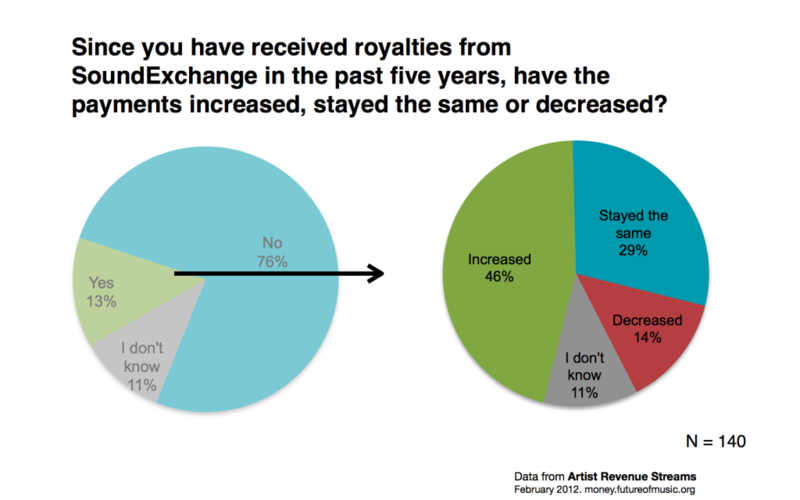 SoundExchange’s royalty distributions continue to grow year by year. For instance, in 2010 the organization paid out $249 million. In 2011, it paid out $292 million to rightsholders. This reflects steady growth in the non-interactive streaming marketplace, and more plays means more royalties for artists and sound recording copyright owners. For the 46 percent who said that their royalties had increased, we asked why. 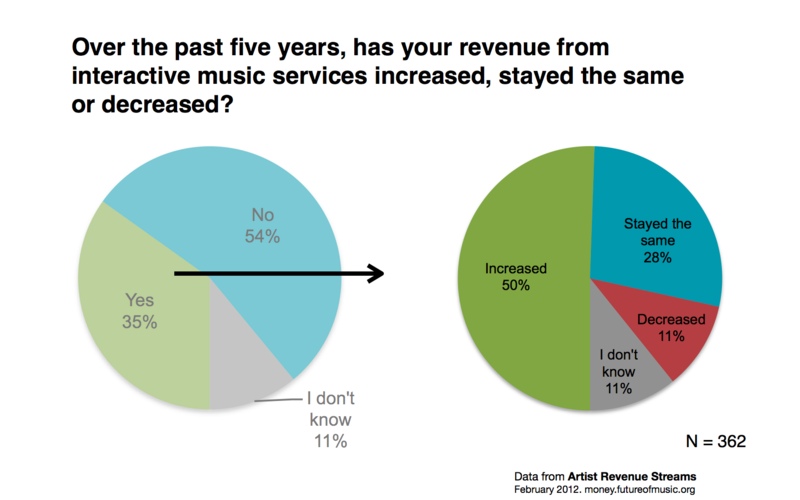 The top reason: the survey respondents had registered with SoundExchange. This is obvious, but important; the royalties cannot flow to artists unless they sign up with SoundExchange. Survey respondents also noted that their recordings are getting more plays, which means more money. 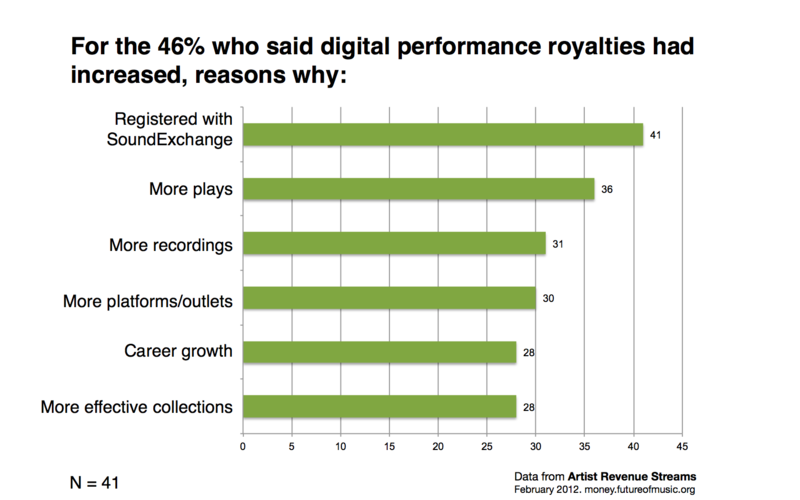 For the 14 percent who said that their digital performance royalties had decreased, only 8 people responded to the survey question about the possible reasons why, so there is not enough data to present specific findings.